recently spent two consecutive Saturdays in a sort of time machine, living the silent movie experience of 1927 — what seemed back then to be its culmination, but was in fact a final blaze of glory before the whole structure collapsed under the onslaught of talking pictures. The first Saturday (on March 31) was a once-in-a-lifetime experience I never expect to repeat, but the second (on April 7) was one I can recreate for myself any time I want — and so can you. 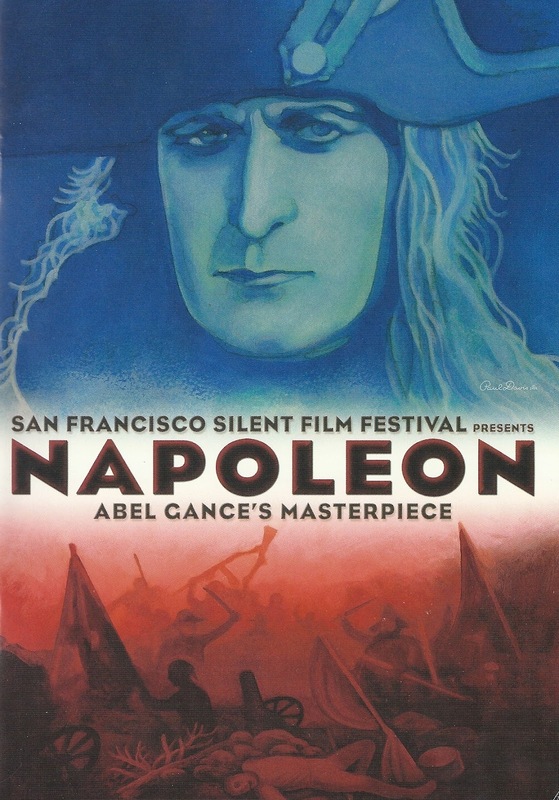 Seeing Abel Gance’s Napoleon as it was meant to be seen — with a live symphonic accompaniment and its climactic three-panel “Polyvision” seqence, including this Tricolor tryptych — truly is a once-in-a-lifetime thing. I’ve been lucky; I’ve seen it three times. The first time was Bastille Day (July 14) 1981, when just about everybody who was anybody in Hollywood — plus a hefty contingent of nobodies like me — crammed the Shrine Auditorium in Los Angeles to see Gance’s masterpiece and to hear Francis Ford Coppola’s father Carmine conduct his own score. That engagement was such a thundering triumph that Napoleon and Coppola pere returned to the Shrine for nine days in December and January ’82, and I saw it again. But this third time topped them both, and it came my way courtesy of the San Francisco Silent Film Festival. The movie I saw at Oakland’s Paramount Theatre was an hour and 45 minutes longer than the one I saw at the Shrine in 1981 and ’82. Some of the extra time was additional footage, some the result of a proper running speed of 20 frames per second (the Shrine speed had been 24 fps). Well, God bless ’em for it. Gance regarded Napoleon as a tragic hero, and he planned a biography in six installments that would take his protagonist from his early revolutionary fervor and triumph through growing tyranny and megalomania to final downfall. But the best-laid plans, you know: Gance blew his budget for all six pictures on the first one, and the rest were never made. Probably just as well in the long run; it makes it possible for the one he did make to end on an exultant note, with the conquest — oops! “revolutionary liberation” — of Italy. But it matters little whether or not you accept Gance’s historical analysis (personally, I don’t; I think Bonaparte was pretty much a Megalomaniac in Waiting from the word go, biding his time while the thugs and jackals of the Reign of Terror lopped each other’s heads off); Napoleon is still a sensual and emotional feast that makes the word “movie” sound too puny to contain it. Seeing it the way we saw it in Oakland was a rare privilege, and I’m telling you right now: If you ever hear of this picture coming to anyplace within a thousand miles of you, do not let this golden opportunity slip by, and do not imagine that it will ever come again. Hop a plane, book a hotel, rent a car, do whatever it takes. I’ll close this half of the post with a YouTube clip of the Napoleon trailer prepared for the SFSFF. Be sure to take it full-screen; it’ll give you (just barely) an inkling. My sister-in-law mentioned a while back that she was embarking on a project to see all the Oscar-winners for best picture that she hadn’t managed to catch up with over the years. First on her list, naturally enough, was Wings — the first (and until this year the only) silent movie to win the Oscar for best picture. Anyhow, back to my sister-in-law’s see-all-the-best-pictures project. It so happened that I had just gotten the new Blu-ray restoration of Wings and had been looking for an excuse to host a screening of it. I urged her not to settle for Wings from Netflix. I learned last year at the Kansas Silent Film Festival that to see Wings on home video is one thing, but to see it projected on a large screen is to understand at last why it won the Oscar (something it has in common with both Lawrence of Arabia and Oliver!). I suggested she wait until I could screen it for her and my brother, she agreed, and the date we settled on was April 7. I would venture to guess that in the transfer to home video, no silent picture has ever been as lovingly and carefully treated as Wings; Paramount Home Video can be as proud of the transfer as they are of the picture itself, for both are justified. 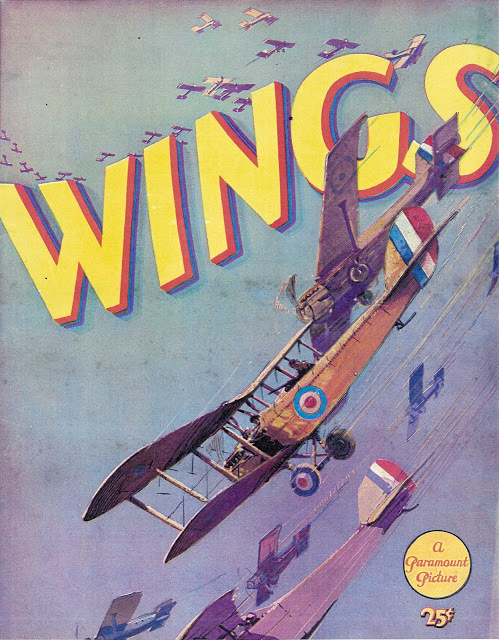 Leonard Maltin’s Movie Guide gives Wings two-and-a-half stars, saying: “One of the most famous silent films is, alas, not one of the best, despite rose-colored memories.” I say it’s Leonard who needs a memory check; Wings is a whopping piece of entertainment, and it set the template for Oscar-winning best pictures, with only rare (and usually regrettable) exceptions, from that day to this: well-crafted crowd-pleasers rather than groundbreaking works of art. While it’s no work of art, Wings is certainly a crowd-pleaser, and extraordinarily well-crafted. The craftstmanship is evident even in straight black-and-white silent prints like the one I saw in Topeka last year, but on Paramount’s Blu-ray it shines like a beacon. 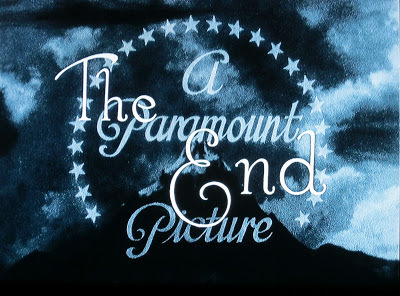 The source material was a dupe negative in the Paramount vault that had nevertheless suffered significant deterioration in 85 years and required a frame-by-frame digital repair. The result is…well, in the supplement documentary, Tom Burton of Technicolor Corp. says, “It’ll never be like Day One in 1927 seeing this release, but it cleaned up a great deal.” Indeed it did; Wings looks like it was shot last week, an impression enhanced by the surprisingly frequent use of telephoto and even zoom lenses. Almost as important as that dupe negative, Paramount also had the original documentation for how the picture was to be tinted — both stock-tinting (amber, violet, sepia etc.) and the Handschiegel process (shown here), which added color to highlight flames, machine-gunfire and explosions; the documents specified exactly the shades to be used and the frames where every tint was to begin and end. Paramount also had access to a single copy in the Library of Congress (perhaps the only copy in existence) of J.S. 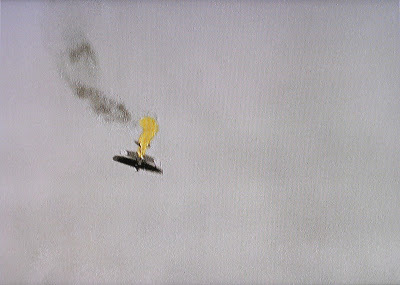 Zamecnik’s original score (well, substantially original — it incorporates numerous popular tunes of the World War I era, and the music for the flying scenes was cribbed from Felix Mendelssohn’s incidental score for A Midsummer Night’s Dream). Zamecnik was a usually anonymous studio musician who did yeoman work assembling Wings‘s music, particularly his main theme, which serves as a wistful love theme, a stirring march, or a soaring anthem, according to the needs of individual scenes. 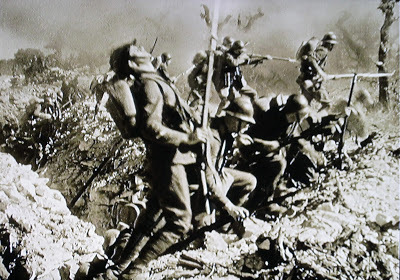 But even on the ground, Wings has some of the most spectacular battle scenes ever filmed, climaxing in director William Wellman’s recreation of the battle of St. Mihiel, the first major American offensive of the war (and one in which the U.S. Army Air Service played a significant role). With 19 cameras posted in trenches, in shell holes, and on towers all over the five-acre location, it’s a sight to see — in fact, I’ve seen some of this footage (uncredited) in a number of documentaries about World War I, and you probably have too. 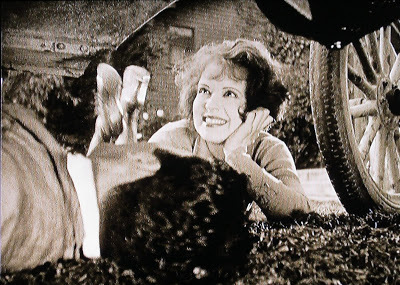 In Silent Stars Jeanine Basinger describes Wings as “an epic war movie enclosing a small Clara Bow movie”, and that sums it up neatly. The structure of the story is Hollywood showmanship at its best; without interrupting the war story or making Bow look like a cornball play for the box-office, Paramount created a picture that absolutely everyone who went to movies would want to see. They still would, and Leonard Maltin really needs to take another look. The review in his book dates back at least as far as the 1980 edition; I’ll bet it was based on watching a VHS tape on a 19-inch TV (Leonard himself may not even have written it). 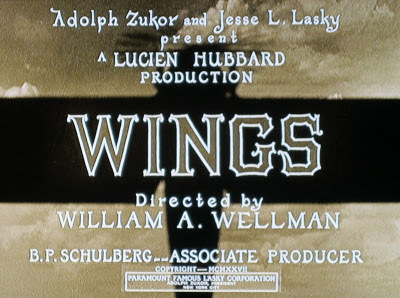 As Ben Burtt says, “I can’t imagine that audiences today would not get excited by seeing Wings.” But as I told my sister-in-law, you have to see it as large as possible; the screen in my home theater is 70 inches wide, and that’s really the bare minimum you need to appreciate it fully. My screening that night certainly made my point. As the music swelled to its crescendo, the final end title faded out, and I brought up the lights, I said: “And that’s why it won the Oscar for best picture.” “No kidding!” somebody said. And as the saying goes, that ain’t chopped liver. *Almost: The battle scenes were originally shown in widescreen “Magnascope” — a surprising link with Napoleon — but none of that footage has survived. Jim: I'm very envious that you got to experience the recent "Napoleon" showing in Oakland. I saw it in Chicago in its first incarnation with Carmine Coppolla conducting his score. The score was serviceable enough, but the experience remains one of the great movie-going experiences of my life. Really quite overwhelming in so many ways. Kevin Brownlow's recent Oscar win may be the most deserving Oscar of all time. The "Wings" section on your post was great. I have a friend who has a home theater and his brother has the new "Wings" BluRay. We'll do some arm twisting to see if we can see "Wings" in the best possible way. I do have the VHS copy of "Wings" and even then it's still a remarkable film. Kevin, "serviceable enough" may sound like damning with faint praise, but I think you've hit it regarding Carmine Coppola's score — though of course I take my hat off to anyone who can compose a wall-to-wall four-hour score (to say nothing of conducting it). Carl Davis's score, on the other hand, is masterful.